Product prices and availability are accurate as of 2019-04-11 18:03:08 EDT and are subject to change. Any price and availability information displayed on http://www.amazon.com/ at the time of purchase will apply to the purchase of this product. 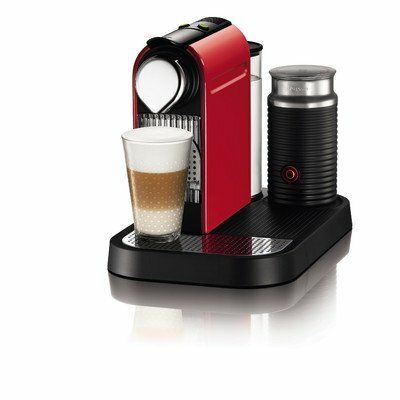 Conceived to please both enthusiasts of Nespresso and lovers of modern design, Citiz is the expression of the union between high tech and retro-modern design inspirations. Citiz & Milk allows you to create an endless number of milk based coffee recipes at the touch of a button. Enjoy Cappuccinos, Lattes and Macciatios in a completely new experience. Nespresso began more than 25 years ago with a simple but revolutionary idea, to create the perfect cup of Espresso coffee with exquisite crema, tantalizing aroma and full bodied taste - just like skilled baristas. As the worldwide pioneer, Nespresso redefined the way coffee lovers around the world enjoy their espresso coffee through a unique combination of premium quality Grand Cru coffees, stylish coffee machines, and exceptional customer service. To obtain the perfect espresso, Nespresso Experts seek out only the ?nest Grand's Crus green coffees, which promise to offer the most tantalizing aromas. The virtuoso alchemists compose the blend from these diverse origins and decide upon a speci?c roasting and grinding pro?le. Each of the Nespresso Grand's Crus has a distinctive character. You can, depending on the variety of different recipes, enjoy Nespresso with milk. When combined with creamy milk foam, you will experience a whole new variety of flavors. The Nespresso Club Services. A world of services at your disposal. The Nespresso Club is always there for you, online, by telephone or in one of our Boutiques. Order your Nespresso capsules, receive personalized advice, and obtain technical support for your machine: whatever you are seeking, the Nespresso Club and its Specialists are with you every step of the way. Benefit from quick & easy ordering whenever, wherever.